Rev.io delivers a usage-based billing platform and a powerful customer management system to scale with your growing business. A powerful telecom and IoT billing platform built for your business. Rev.io’s robust telecom and IoT billing platform does the heavy lifting on back-end operations so you can focus on long-term growth. Our easy to use platform comes with the tools needed to accurately manage billing from quote-to-cash while saving time by leveraging existing integrations with your applications and processes. Scale your business with our adaptable, telecom billing software and customer management modules. Our platform allows you to bill for any recurring, metered, or one-time service. Win more business and get an edge on the competition. We help you move quickly from quote to cash and give you the tools you need to master this integral business process. Give your team the tools they need to manage your customer relationships through the entire lifecycle – all in one place. Create a powerful ecosystem of CRM, tax engine, and gateway systems through our robust API or native 3rd party integrations. Your customers are too important to have disparate systems. Rev.io delivers everything you need to win business and grow fast. Take full control of your billing operations with our powerful recurring and metered billing platform. Rev.io has automated rating of over 100 different usage formats to eliminate errors and helps you be the first to market. Manage every aspect of your customer’s account – from taxation to order entry – all in one place. Rev.io gives you the tools you need to encourage customer loyalty and increase revenue opportunities. Customizable workflow processes allow you to easily automate and manage any project to fit your unique business’s unique needs. Increase billing accuracy and measure efficiency across all of your business activities without adding cost. Get the right insights you need to scale at the right time. 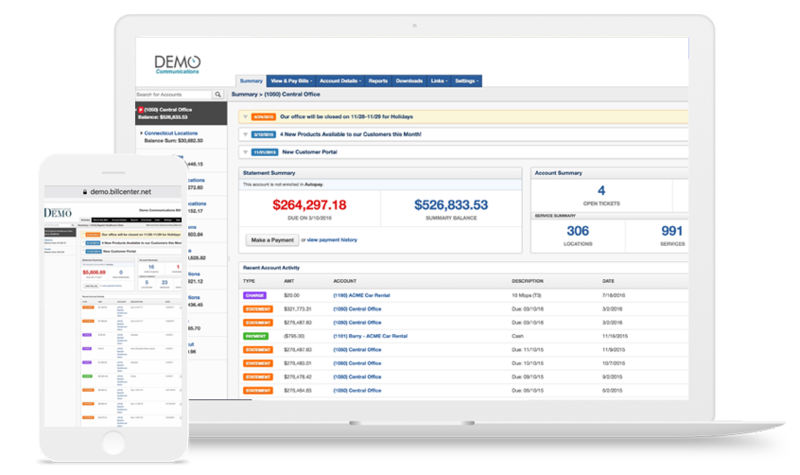 Identify top customers, churn, MRR, accounts receivable, order summaries, and more in one consolidated view. Business intelligence reports empower you to make informed business decisions using quality data and built-in reporting. Ensure your business runs smoothly across all of your platforms, devices, and networks. The Rev.io telecom and IoT billing platform connects with many applications that you’re already using. Whether you use our existing CRM, tax engine and gateway integrations, or use our enterprise level API to develop custom integrations, we keep all aspects of your business connected. Empower your customers and partners to take charge of their own accounts with our dynamic customer and agent portals. With bottlenecks eliminated, agents can automate their own commission calculations, inventory reports, and more. Before offering a solution, we get a thorough understanding of your business’s unique needs. Our flexible platform allows us to build a solution customized to your business. Plan your implementation, migrate your data, and integrate with your partners. We help your team every step of the way and act as a trusted partner, invested in your success, long after the onboarding process is complete. Your success is our success. Our technology is built to support your business as it scales to ensure smooth growth. Is Your Billing System Ready for Modern Business? Discover five steps to increase productivity, streamline your process, and boost customer satisfaction. We’re proud of our client-driven roadmap. Check out the Rev.io Ideas forum to share your suggestions, vote for other’s ideas, and connect with the Rev.io Community. Is Rev.io the Right Fit for Us? Take a deeper look into our sophisticated billing and customer management solutions. You can’t afford to trust the wrong billing partner with your revenue. Our annual memo is a great way to get to know Rev.io’s culture & company! Get the tools you need to sharpen your competitive edge. From usage-based billing to in-depth data analysis, Rev.io helps you stay competitive in any market – Ready. Set. Innovate.